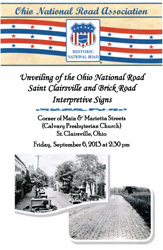 The twenty-third and twenty-fourth Ohio National Road interpretive signs were unveiled in St. Clairsville, Belmont County, OH on Friday, September 6, 2013. 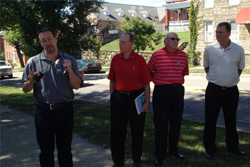 ONRA President Doug Smith spoke to a crowd of about 30 interested parties who were on hand for the occasion, including (left to right): Mayor Robert Vincenzo, Jim Benda (City Maintenance), Brian Kralovic (City Buildings & Grounds Superintendent), City Service Director Dennis Bigler, Doug Smith, Gabe Hays, John Marshall, former ONRA Board member Jeana Paglialunga, City Councilman John Bukmir, John Paglialunga, Richland Twp. 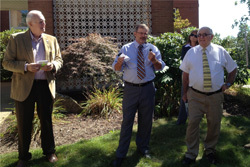 Trustees Greg Reline and Greg Bizzarri, Rev. Laurie Armstrong (pastor of Calvary Presbyterian Church), Linda Wagstaff and ONRA Board members Ed Wagstaff and Mike Peppe. 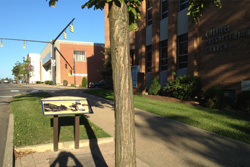 The first of these signs, commemorating historic Saint Clairsville, is located in front of the Calvary Presbyterian Church near the corner of Main (the Historic National Road) and Marietta (OH Route 9) streets in St. Clairsville, OH 43950. 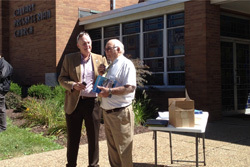 St. Clairsville Mayor Robert Vincenzo (shown on the right with ONRA President Doug Smith) welcomed all those present, and spoke about the privilege of being located on the National Highway. 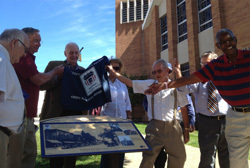 He added that he hopes the interpretive signs will remind residents of the rich history of their town. 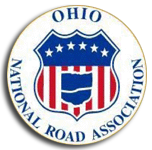 Speaker Gabe Hays, of the local Hays Landscape Architecture Studio, Ltd. and one of ONRA’s founding members, spoke about his pride in the community and all that the Ohio National Road Association has accomplished. He pointed out the curbstones from 1906 that are placed around the sign. Pictured (left to right) are: Gabe Hays, John Marshall, St. Clairsville City Councilman John Bukmir, and Richland Township Trustee Greg Reline. 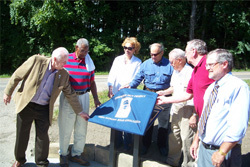 The “Saint Clairsville” Ohio National Road interpretive sign is about to be unveiled by (left to right): Mayor Vincenzo, ONRA Board member Ed Wagstaff, President Doug Smith, Board members Cathy Nelson and Mike Peppe, Belmont County Tourism Council Director Doc Householder, Service Director Dennis Bigler and ONRA Board member Dr. John Mattox. 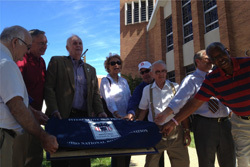 The moment of unveiling arrived for (left to right): St. Clairsville Mayor Robert Vincenzo, ONRA Guernsey County representative Ed Wagstaff, ONRA President Doug Smith, ONRA At-large member Cathy Nelson, Belmont County Tourism Council Director Doc Householder, ONRA Franklin County representative and Sign Project Chair Mike Peppe (behind Doc), Service Director Dennis Bigler and ONRA Belmont County representative Dr. John Mattox. 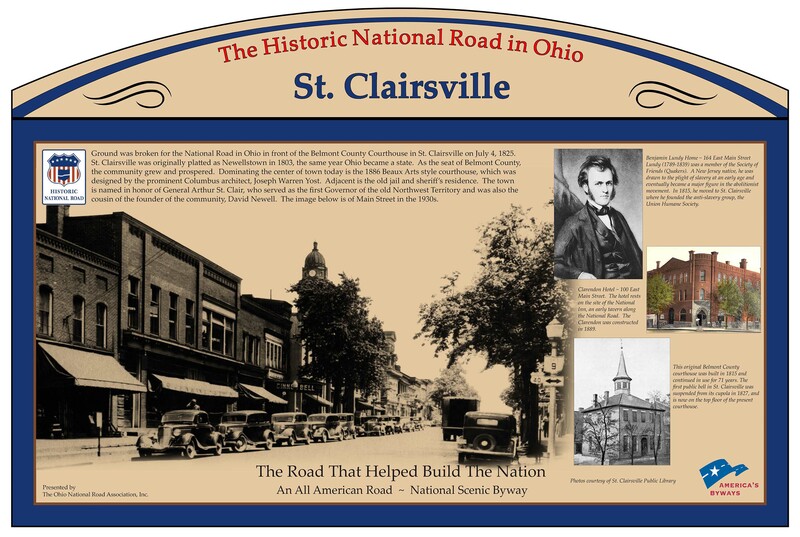 The St. Clairsville interpretive sign depicts the City’s history as it relates to the National Road. 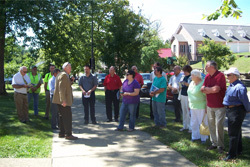 In fact, as ONRA President Doug Smith pointed out, ground was broken for the National Road in Ohio in front of the Belmont County Courthouse right here in St. Clairsville on July 4, 1825. The sign also honors Benjamin Lundy, a major figure in the abolitionist movement, who moved to St. Clairsville in 1815. 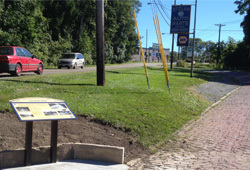 Following the first unveiling, participants carpooled to the “Brick Road” Ohio National Road interpretive sign which commemorates the brick paving of the National Road during World War I, and is located along an original brick segment of the National Road in front of the St. Clair Auto Parts NAPA Store located at 48530 National Road W. in St. Clairsville, OH. The Brick Road sign is ready to be unveiled by (left to right): ONRA President Doug Smith, Board members Dr. John Mattox, Cathy Nelson, and Mike Peppe, Belmont County Tourism Director Doc Householder, ONRA Board member Ed Wagstaff, and St. Clairsville Service Director Dennis Bigler. Standing proudly behind the newly-unveiled Brick Road sign are (Left to right): Doug Smith, Dr. John Mattox, Cathy Nelson, Mike Peppe, Doc Householder, and Ed Wagstaff. The “Brick Road” Ohio National Road interpretive sign explains that in 1918, prison labor was used to pave more than 75 miles of National Road in eastern Ohio with bricks, and at the time was the longest continuous stretch of brick pavement in America. 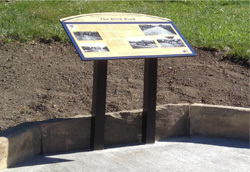 Note the re-purposed curbstones from 1906 that are placed behind the sign.